Sound Words of Advice from Reno Omokri to Efe. Indeed stardom comes with many things. Ever since Efe a.k.a. 'based on logistics' was declared the winner of the second edition of the BBNaija reality show, he has become the current sensation of many Nigerians. It is now very rare to see a Nigerian make a sentence without adding "Efe" to it. In fact, friends and enemies, lovers and haters are now claiming relationship with him. Lol! Success is really good. Winning is bae. Yels! (in Jenufa's voice). Efe's victory has taught many Nigerians great lessons and it is a part of such lessons that Reno Omokri is sharing with Nigerians even as he offered powerful words of advice to Efe a.k.a Based on Logistics, who is the winner of the 2017 edition of the Big Brother Naija. According to Omokri, you should believe in yourself even if nobody believes in you and your bed of success should always be dressed pending the arrival of success. 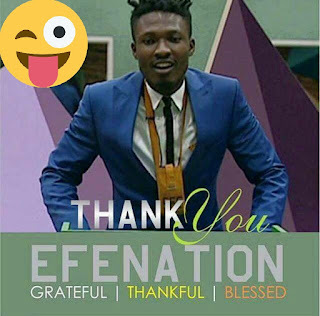 Advising Efe, he said, when the time comes for him(Efe) to settle down, he should marry a prayerful wife because no matter how beautiful a wife is, her beauty can’t help him deal with tough times. Hmmm! If Efe should go by this advice, I am sure many Nigerian girls will turn prayer warriors just to win his heart. There is nothing twenty five million naira can't do. Lol! A few months ago Efe was a nobody. Today, he is the most popular Nigerian. Believe in yourself even if nobody believes in you. And very importantly, don’t wait until you are successful before dressing for success. Don’t wait until you are broke before you start managing your money. And Efe, now that you are rich and famous, when the time comes, marry a prayerful wife because no matter how beautiful a wife is, her beauty can’t help you deal with tough times when they come, and believe me, they will come.